Over a year ago I posted about a disaster I had using some old Prosculpt. What should have cured a soft pale colour, ended up a dark mottled tan/brown. I didn't trash the piece, thinking that someday I would play around and just see if I could save her. My poor little fae "fresh" from the oven. Originally I thought of using the darkness of her skin and doing something earth (or dirt) related, but this didn't overly inspire me. Last month, the ADO Monthly Challenge was "Spring Enchantment". I was responsible for this challenge so obviously had to create something. 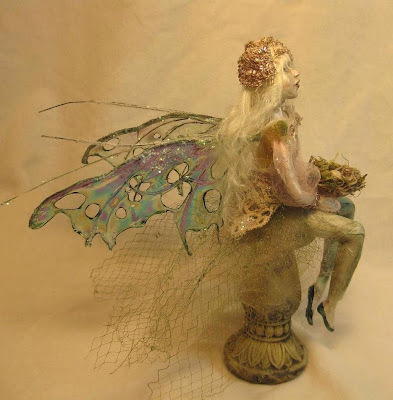 I pulled the poor little fae above from my discard basket and started painting. She received a coat of gesso, three coats of Titan Buff (Golden acrylics),a coat of Green Interferance and some Burnt Umber wash (to give her a slightly antiqued look). I painted her features, wigged her, costumed her in antique laces and netting and used the wings I had made from fantasy film. 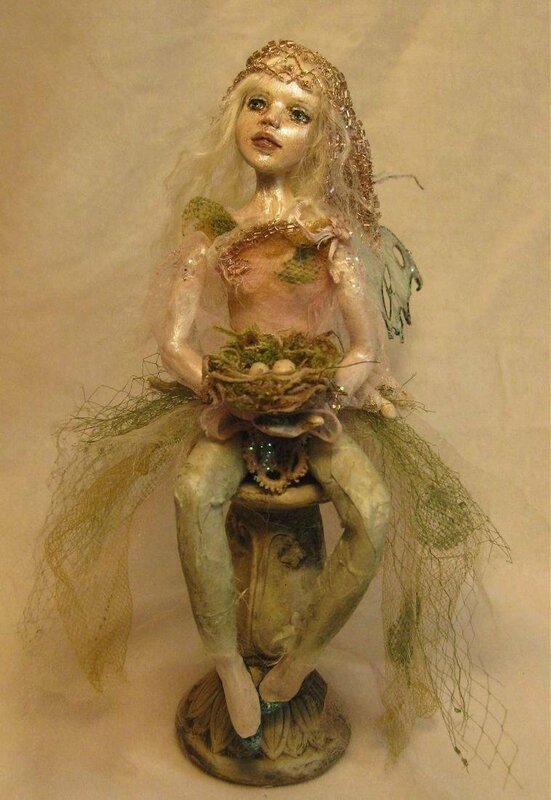 She is holding a small nest I made with two little eggs in it and sitting on a "stone" (actually a repurposed resin candle stick) pedestal. My ADO Spring Challenge piece ..."Rebirth"
I have a couple more pieces that I have thrown in my discard basket and one of these days, I may just see about making some more lemonade out of one of them. 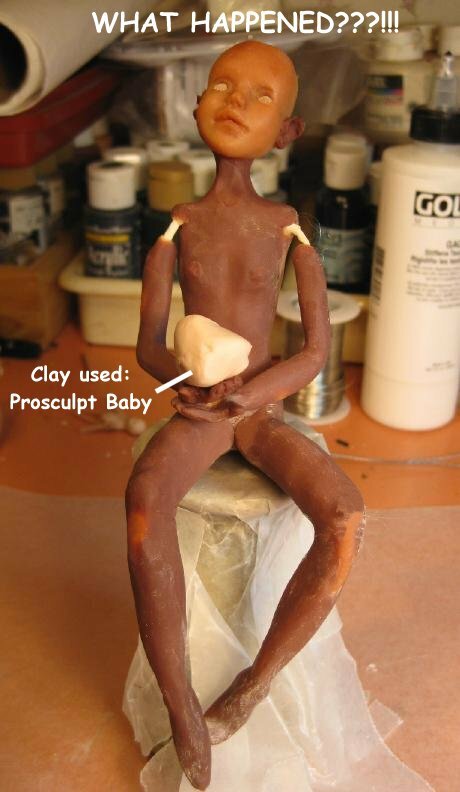 For now though, I'm on to some completely new work - using clay that I know will cure properly. Wow that really is lemonade from a lemon. Good thing you saved her because she turned out beautiful! I love her!! It is a true artist that can turn disaster into beautiful art. She certainly was reborn :-) Love her. I need some advice re painting Fimo Puppen clay, any help would be so appreciated. It's for my project the one I can't reveal until it's done. She turned out fantastic. I think sometimes our muses think to far ahead of us...then we have to wait until we catch up to understand what they were wanting us to do with a piece. I think this was just what this lil darlin was suppose to be. Wow! She turned out beautifully. Her skin has a fabulous glow. I love the muted colors you used, too. You really know how to make lemonade. And she turned out so beautiful!!! I love when this happens. Serendipity! And, I'd give anything to know how you ever made those fabulous butterfly wings! 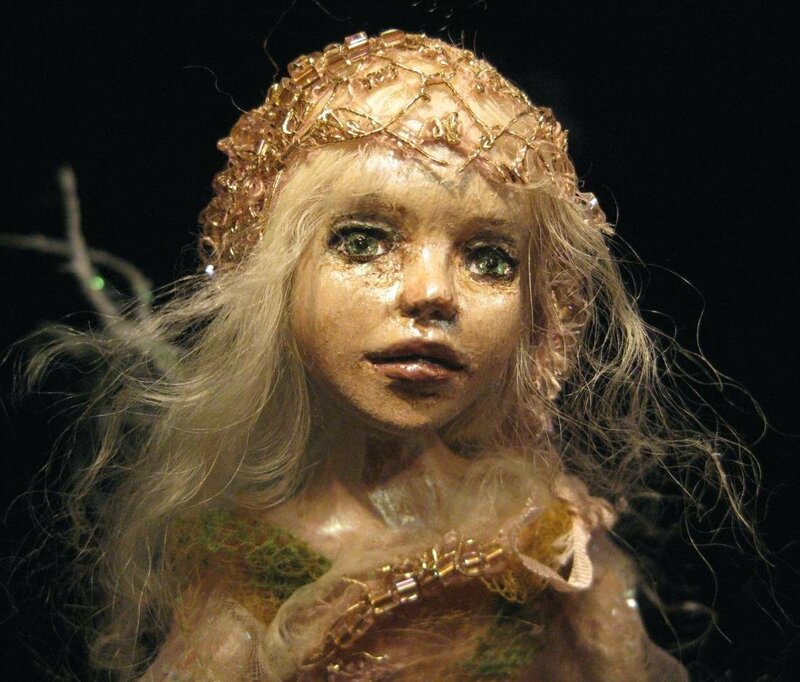 I know nothing about doll making however, I know beauty when I see it..and whe is beautiful. I cannot imagine having the talent to do this..really! I'm so glad you didnt trash her Sue, look what a little beauty she really is ! oh, look at her... She is gorgeous! She is who she is supposed to be,perfect in every way. wow....she turned out great for a salvage project! Your imagination always inspires me! Love the Antique look and the wings are beautiful. I do the same thing I throw stuff away in a box and then later on I will see my unfinished work and I have a day or two of just getting it all done. Then I feel wonderful. What a great job you did! She is stunning!! I cannot believe she was once in your discard basket!! I especially love her exquisite wings. What an amazing difference! She is absolutely fantastic Sue!!! A rebirth indeed! Oh my gosh, she is soooo Beautiful and to think you were going to throw her out. Its amazing how a thing of beauty can come from what you thought was a mistake. They say there are no mistakes and this proves it! She is beautiful and I just love how the wings turned out! this is beautiful! here's to rebirth!